YOUNI mobile is a german mobile Web2.0-Community designed for young people such as schoolars, apprentices and students. The brand "YOUNI mobile" describes a prepaid mobile phone offered by the Deutsche Elbkom GmbH in collaboration with E-Plus Mobilfunk GmbH & Co. KG. A unique part of the product is a mobile Community that can be used free of charges. The mobile portal includes services such as E-Mail, RSS News, Messaging, Weather information, bookmarks and access to the whole Community (profiles, guestbooks, groups). The Website, the community as well as the processes for simcard ordering and activation were implemented by comnitec. Furthermore, the exisiting community was ported for mobile devices (youni.mobi). In 2004/2005 comnitec developed a meta ordering plattform for LIVIN Marketing. The shop systems integrated different delivery services for beverages, food and related stuff. 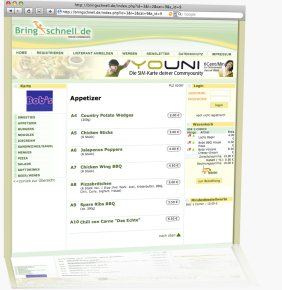 Using the domain bringschnell.de users can seek for a delivery service in their area (zip code) and uniformly order food and drinks. Cateres are notified by using Telefax or alternatively SMS services. Besides the bringschnell.de Front-End, comnitec also developes business related modules such as billing, catalog-Management, allowance-management and affiliate-Marketing which are accesible via Back-End login. 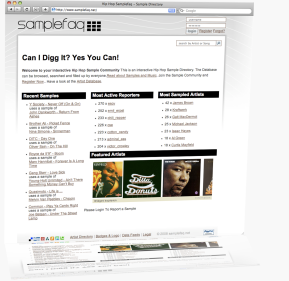 Samplefaq is an interactive music directory and aims to clear samples used in actual music productions. The directory is maintained by the internet community and currently comprises approximately 4000 songs and 2000 artists (see artist directory). The portal also entertaints the user by using third party multimedia embeddings (such as youtube or imeem). Rubadoc is the result of my diploma thesis that I handed in in january 2008. The subject of the thesis is "Documenting The Collaboration Aspect of Software Systems". 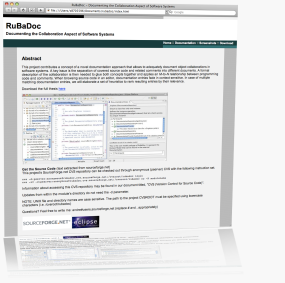 The source code of the project is available as OpenSource (BSD Licence) obtainable on the sourceforge developer portal. The documentation plug-in builds on top of the Eclipse Platform and fades in documentation in a seperate view depending on current context.